Over the past year, 344 days to be exact, I have lost 49 pounds and I have 6 more to go to my goal. 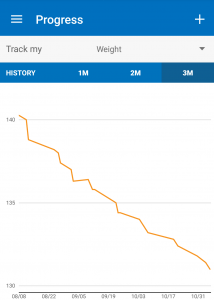 I’ve found that losing weight isn’t difficult but it’s not smooth sailing either. It’s not a linear process. 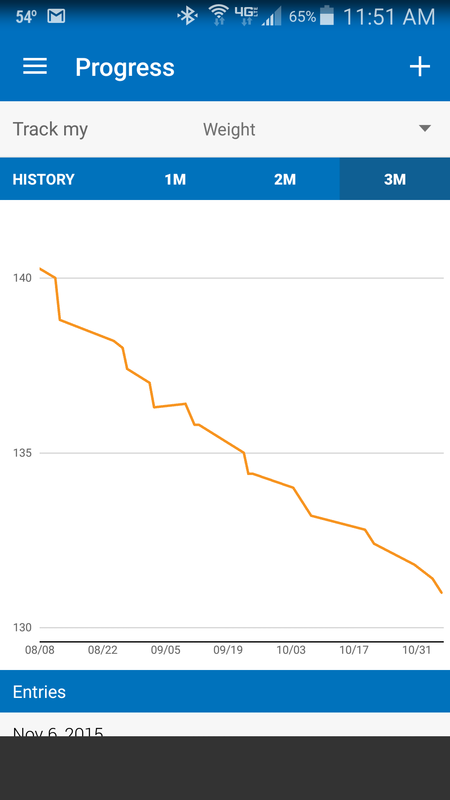 Taking a look at my weight loss over just the past three months, it’s not a perfectly diagonal line but rather more like a staircase, with a few steps leaning the wrong direction. But I’ve grown accustomed to that. However, now that I’m nearing my goal, I’m turning my focus to maintaining my weight and that scares me because I know that is the hardest part. Somewhere between 3-5% of people who lose a significant amount of weight keep it off for at least 5 years. That’s not exactly encouraging. 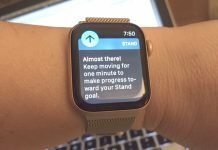 Though, I have found a study indicating 31% of people keep it off most successfully by staying physically active and planning their meals daily (Kruger, Blanck & Gillespie 2006). So Why Do We Regain Lost Weight? When I hit 134 pounds, down from 180, my appetite went through the roof. My appetite had never been a problem before. Even limiting myself to 1200-1300 net calories a day, I was able to stay within my calorie range, for the most part, with relative ease. But once I got down to 134, I noticed a change. It became increasingly difficult to feel satisfied eating 1300 calories a day. Heck, I felt like eating that for breakfast. So what was going on? After we lose a significant amount of weight, our hormone levels change and not in our favor. The hormone leptin, which tells our brains how much body fat we have decreases. This increases appetite. Ghrelin, another hormone increases and stimulates feelings of hunger. 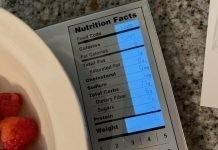 On top of all that metabolism slows (Study Shows Why It’s So Hard To Keep Weight Off) This all stems from the thousands of years of human evolution when our ancestors commonly went through food shortages. For most of human history, food has been hard to come by and our bodies are excellent at keeping us alive through those lean times and fattening us up during times of plenty. That’s a good thing, except when there are no lean times and food is everywhere. So Am I Doomed To Regaining Weight? Just knowing what’s going on in my body helps tremendously. If I didn’t know, I’d think it was just me losing my will power. It’s not. I haven’t lost my will power or dedication to being healthier. But I’m going to really have to stay on top of this game if I’m going to win. Studies suggest diets higher in protein help, so does remaining physically active and not just walking the dog around the block active, but really physically active. That means, losing the weight was not half the battle. It was like maybe one-third, if that. Your real commitment to physical activity begins AFTER losing the weight because honestly, you don’t even have to exercise to lose weight. Losing weight is all about calorie intake; keeping it off is more about physical activity. So, instead of denying my body what it’s asking for, I went ahead and increased my calories, even though I’m still losing weight. I’m still below maintenance level calories but above fat loss calories. Hopefully by doing that my body will realize that I’m not starving to death or in danger of starving. I’ve also increased my workouts and protein in my meals. I’ve noticed that if I eat a filling breakfast with a significant amount of protein, I set myself up for a good day. Snacking is my downfall, not big meals, so if I can feel full longer I’m much more likely to refrain from snacking so much. I’ve also noticed that if I work in a good workout in the morning, it buys me calories for the rest of the day and those are so nice to have later! I’m going to focus on eating healthier. I know that sounds funny. You’d think that eating “healthy” was what caused me to lose weight in the first place but nope! Cutting calories didn’t mean I was only eating healthy, wholesome foods. In reality, I was only focused on the number of calories and not necessarily the nutritional value of what I was eating. It was tough enough just to learn how to calculate how many calories I was eating and burning. Trying to learn how to prepare new meals at the same time seemed overwhelming, so I only focused on working out and overall daily calorie intake. But I’m going to have to do a lot more research on what exactly healthy eating is anyway. I’m also going to continue weighing myself every single day. Yes, every single day. I lost 20 pounds a few years ago and gained 30 back mostly because I stopped paying attention and then just gave up. I don’t want to do that again. I’m going to continue logging the foods I eat. That has been the most important part to losing weight. MyFitnessPal has been my best friend – one that I’d wish would shut up sometimes, but a brutally honest best friend. 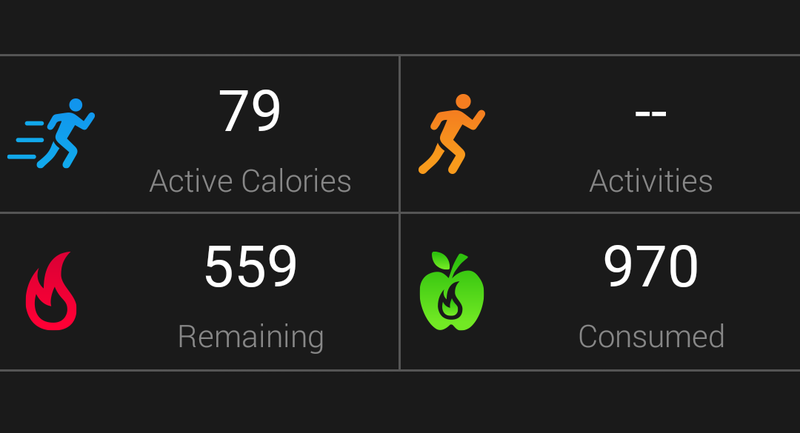 I also have a fitness tracker in the Garmin Vivoactive and it’s motivated me to be more physically active. But I’m not here to give advice on how to keep weight off. If my plan works, then I’ll feel qualified to do so. This is just my game plan to work with my body instead of against it. It wants me to regain the weight. I’ve got to convince it that it doesn’t need to. We’ll see who wins.